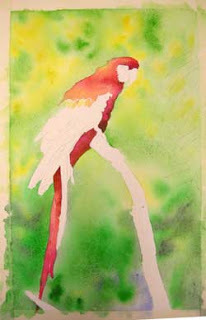 Continue with the previous technique to paint the tail and the tail feathers. You may notice that I used even darker colors on the bird's chest and lower areas, especially against the overlapping wing area. Once the wash was applied, I added a little Quinicridone Magenta and VanDyke Brown to these very dark areas while the area was still wet. This softened the wash but kept the edge next to the wings quite pronounced, thus the gentle shadow. Be sure this wash is completely dry before you move on to the next step. Dry your painting with a hair dryer or allow to air dry. When you touch the painting, it will feel cool to the touch if it is still damp. The paper should have a uniform temperature and dryness when it is ready for the next application.